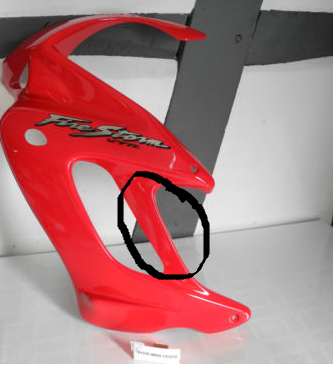 I'm needing to replace my left side oem fairing. Aside from a new oem piece, what is preferable? I'm seeing "ABS plastic" and fiberglass. I'm sure the fiberglass is the last to use, but what about the ABS plastic, would anyone suggest using that? I can get 2 new pieces right and left of ABS on ebay for $150. Anyone have any advice for me on that? There's 2 options here, the whole set, or left & right pieces. Every set of Chinese plastics I have used are of an ABS plastic that seems much more brittle than OEM plastics> Dont claim to know why, just know they crack easily as compared to OEM. Why is the fiberglass the last one to use? I mean I'd buy Sharkskinz. Anything no name your quality, fitment and results/satisfaction are going to vary. My first choice would be to get a good OEM painter piece, repair it PROPERLY if necessary, and then get it painted. New painted OEM bodywork is pretty much going to be impossible to find. I haven't seen a new piece of red bodywork for sale in many years on Ebay and I'd wonder if it's been available from Ron Ayers/Partzilla/the Honda dealer in quite awhile either (just because it lets you buy it on their website doesn't mean it's actually available-been down that road with bodywork already and got an email and a refund weeks later. I'd call ahead to be sure so you don't waste your time). The Chinese stuff...you get what you pay for... I'd much rather buy Sharkskinz and have them painted. I'm parting a red '02 out but sold the left fairing already (still have the tail, tank and right side fairing) sorry. Last edited by captainchaos; 10-21-2017 at 02:58 PM. What's wrong with your fairing? Is it cracked, rashed, missing? I would go with those Chinese ones you posted. That's an awesome price and heck its fairing. It looks good in the pics. May not be as durable but that's expected. Fiberglass is better for racing but if you factor in the cost of painting you cant come close to the ones you posted. REG/rec - any better replacements?